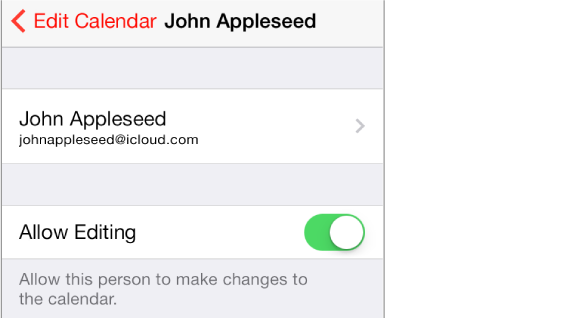 You can share an iCloud calendar with other iCloud users. When you share a calendar, others can see it, and you can let them add or change events. You can also share a read-only version that anyone can subscribe to. Create an iCloud calendar. Tap Calendars, tap Edit, then tap Add Calendar in the iCloud section. Share an iCloud calendar. Tap Calendars, tap Edit, then tap the iCloud calendar you want to share. Tap Add Person and enter a name, or tap to browse your Contacts. Those you invite receive an email invitation to join the calendar, but they need an iCloud account in order to accept. Change a person’s access to a shared calendar. Tap Calendars, tap Edit, tap the shared calendar, then tap the person. You can turn off their ability to edit the calendar, resend the invitation to join the calendar, or stop sharing the calendar with them. Turn off notifications for shared calendars. When someone modifies a shared calendar, you’re notified of the change. To turn off notifications for shared calendars, go to Settings > Mail, Contacts, Calendars > Shared Calendar Alerts. Share a read-only calendar with anyone. Tap Calendars, tap Edit, then tap the iCloud calendar you want to share. Turn on Public Calendar, then tap Share Link to copy or send the URL for the calendar. Anyone can use the URL to subscribe to your calendar using a compatible app, such as Calendar for OS X.